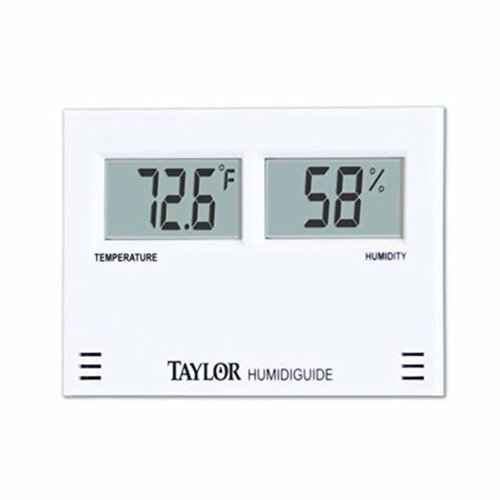 The Taylor Digital Thermometer/Hygrometer Combination Unit is compact, accurate and easy to use. This combination unit measures temperatures from -58- to 158-degrees Fahrenheit in .1-degree increments. Humidity is measured from 20- to 95-percent; 1-percent increments are displayed in the 30- to 83-percent range, and 3-percent increments outside this range. An easy-to-read LCD display provides at-a-glance measurements from almost any angle. Can be displayed using a built-in stand or mounted on the wall. Requires two (2) AAA batteries (included). This combination unit measures temperatures from -58- to 158-degrees Fahrenheit in .1-degree increments. Humidity is measured from 20- to 95-percent; 1-percent increments are displayed in the 30- to 83-percent range, and 3-percent increments outside this range. An easy-to-read LCD display provides at-a-glance measurements from almost any angle. Can be displayed using a built-in stand or mounted on the wall. Requires two (2) AAA batteries (included).